The designer of ‘the most glamorous car in the world’ will be honoured at a special ceremony at Loughborough University in May. He was one of the first designers to apply the principles of aerodynamics to cars with his scientific calculations, creating one of the most beautiful forms of the era. Sadly he died in 1970, aged 54. To recognise the outstanding achievements of Malcolm Sayer Loughborough University has joined forces with the Jaguar Daimler Heritage Trust (JDHT). The Trust has kindly offered to donate a bronze commemorative plaque, which will be displayed by the Department of Aeronautical and Automotive Engineering in the Stewart Miller building. It will be the third plaque to be presented by the JDHT to commemorate the achievements of people who have played an important part in the history of the Jaguar company. The plaque will be unveiled at a special ceremony on 21 May and will be followed by a celebratory reception on campus at the Henry Ford College. Guests will include Roger Putnam, Chairman of Ford of Britain and the JDHT Board of Trustees, Professor Sir David Wallace, the University’s Vice Chancellor, and several members of the Sayer family. There will also be several vintage Jaguar cars on display. 1. Members of the media are invited to attend the event, which starts at 11.45 in the main foyer of the Stewart Miller building on Saturday, May 21. The unveiling of the plaque is due to take place at 12.30pm. Anyone wishing to attend is asked to contact Judy Smyth prior to the event. A photograph of Malcolm Sayer is available upon request to the PR Office. Malcolm Sayer was born in Cromer, Norfolk. At the age of 11 he passed the scholarship exam for Great Yarmouth Grammar School, and found his interest in mathematics and science. He gained the prestigious Empire Scholarship at the age of 17 to bring him to the then Loughborough College, where he gained a first class honours diploma in Automotive Engineering. He was also Secretary of the College motor Club and for two years Editor of the College Magazine. 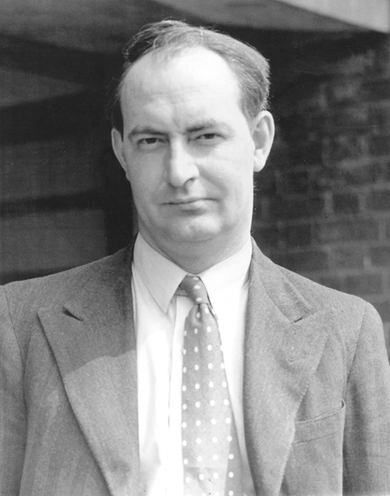 After graduation, Malcolm joined the Bristol Aeroplane Company, studying aeronautics and looking at ways of improving the efficiency and design of significant WW2 aircraft, particularly the Blenheim and the Beaufighter; and developing his expertise in aerodynamics as applied to mechanical design. In 1948 Malcolm had the opportunity to go to Baghdad University where he established the Faculty of Engineering. In 1950 he returned to England and joined Jaguar. Here he designed the first post-war British sports/racing car capable of challenging the supremacy of Mercedes and Ferrari, which had been dominant since before the war. He designed the “C” type Jaguar which won Le Mans first time out and then for three years running. His unique method combined logarithms and complex mathematical formulae to plot the precise intricacies of a 3D treble curved shape and volume to develop the optimum aerodynamic curved shape. 1952 saw the design of the Jaguar “D” type, which like the “C” type used a relatively small engine aided by aerodynamics, and went onto become the worlds most successful sports/racing car. In 1961 full time production of the aerodynamically and mathematically designed road going “E” type Jaguar commenced. Production lasted until 1974 with 72,000 cars being produced. Malcolm worked as Director of Design at Jaguar until his untimely death in 1970. 3. Loughborough has an established reputation for excellence in teaching and research, strong links with industry, and unrivalled sporting achievement. Assessments of teaching quality by the Quality Assurance Agency place Loughborough in the top flight of UK universities, and industry highlights Loughborough in its top five for graduate recruitment. Around 45% of the University’s income is for research. The University has been awarded four Queen’s Anniversary Prizes: for its collaboration with aerospace and automotive companies such as BAE Systems, Ford and Rolls Royce; for its work in developing countries; for pioneering research in optical engineering; and for its world-leading role in sports research, education and development.